Exponential growth in high-speed data, Internet, and video services is creating a huge demand for additional bandwidth and capacity on optical networks. And even though the optical networking industry has responded by increasing capacity through advanced modulation formats, higher baud rates, and upgrading from 10G to 100G and now even 200G wavelengths, there’s still room to increase performance further. 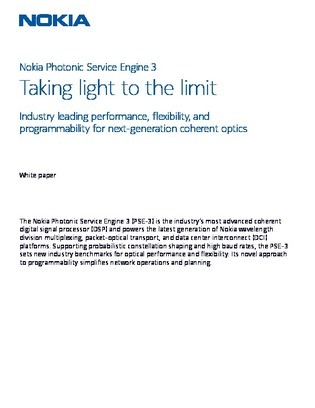 Learn about the new Photonic Service Engine 3 from Nokia that looks to further improve optical performance, flexibility, and programmability across a wider range of wavelength capacities.